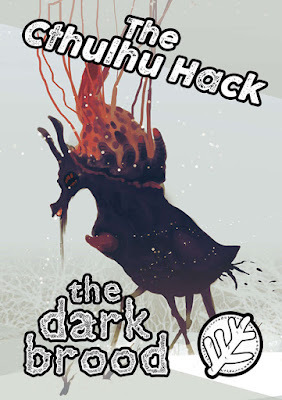 The Dark Brood is a supplement for The Cthulhu Hack, the the elegant, stripped back player-facing roleplaying game of Lovecraftian investigative horror published by Just Crunch Games and based on The Black Hack. It explores the nature and fecundity of Shub-Niggurath, ‘The Black Goat of the Woods with a Thousand Young’, presenting possible manifestations of both herself and her ‘Dark Brood’, examples of her Dark Brood, a set of adventure seeds built around them, and more. This comes packaged in a slim booklet, not illustrated, but cleanly and clearly laid in fashion which is easy to read and grasp. The idea is that the incessantly fertile womb of Shub-Niggurath serves as a ready source of strange new horrors, impossibly copious in form, but limited in terms of their existence, and born of an uncaring mother to slither forth to spread horror and chaos, to serve those dedicated to the worship of their mother, and to scream and squall having been abandoned by her. For Shub-Niggurath herself, The Dark Brood suggests five aspects—Creator, Nurturer, Sustainer, Guardian, and Incubator. The descriptions accompanying these aspects do not go into any great depth, the supplement focusing more on her offspring than on ‘The Black Goat of the Woods with a Thousand Young’, but they perhaps represent more attention than has been paid to her in any number of roleplaying supplements for Lovecraftian investigative horror over the years. This is not to discount the number of scenarios that involve Shub-Niggurath, but these aspects do indicate that there is scope for further examination of them. Perhaps there is room for an anthology of full scenarios dedicated to her—even from Just Crunch Games. From the wellspring of chaos that is Shub-Niggurath’s womb, The Dark Brood suggests that her children take on three forms. These are as the almost human-like Avatar, sect-leader, begrudging but wise adviser, or power behind the throne; as Servitors, bound as bodyguards, hunters, assassins, and so on, often to serve a cult leader; and as Mindless Progeny, womb-spawn spat out to do more than destroy, desecrate, and despoil. Six examples of Dark Brood are given, each randomly created using the mechanics presented in the earlier supplement, From Unformed Realms. They include the Devil Hound, an oddly triangular canine-like thing whose gaze burns flesh, is able to move through certain materials without trace, and the touch of which causes strange dreams of the womb, whilst the Ophidiaes is a massive creature with a bite which melts flesh and who leaves behind a faecal trail of partially digested flesh. The six are all examples of Mindless Progeny rather than Avatars or Servitors, so there is scope again for material that develops and presents examples of these forms. Some of the six example Mindless Progeny are perhaps underwritten in terms of their purpose, the following trio of Adventure Seeds make up for it. They include strange goings on in a fertility clinic, a handful of missing children on forestry land of which local travellers are the primary suspects, and the strange death of a pioneer in the sports drinks industry. These are nicely developed, each a page or two in length, with multiple suggestions for getting the investigators involved, and each easy for the Keeper to develop into a full adventure. Options for worshippers of Shub-Niggurath are also given. These explore who and why someone might so worship her, so those who worship her for Betterment might be radical lifestyle gurus, dieticians, and so on. Other options include Breeding, Contagion, Indulgence, and even Philanthropy! These are accompanied by a number of rituals devoted to Shub-Niggurath, all quite nasty and quite detailed. The suggestions are that they were part of witchcraft practices, of fairy legends, and of alchemy, but hints that in them there may be something more akin to modern chemistry. How this rituals might be learnt is up to the Keeper to decide (or perhaps a future supplement?). Rounding out the supplement is an ‘Obligatory Random Table’, consisting of ten entries which work as encounters, nudges, and so on that can be rolled for during a game or used as inspiration by the Keeper. Again, this is a good set of ideas and suggestions for her use. The Dark Brood examines Shub-Niggurath like no supplement before, presenting a rash of ideas, creatures, adventure seeds, spells, and more. Yet there is a sense of frustration to the booklet, for it touches upon certain elements without developing them, like the other two aspects of Shub-Niggurath’s avatars, the cults devoted to her, and so on. To be fair though, this is a slim volume, so there is not the room for everything else a Keeper might want in a supplement devoted to her. Ultimately, The Dark Brood is an interesting and likable booklet which handily supplements any information about ‘The Black Goat of the Woods with a Thousand Young’ a full rulebook might contain. In the meantime, the Keeper will have to wait for the definitive supplement on Shub-Niggurath.